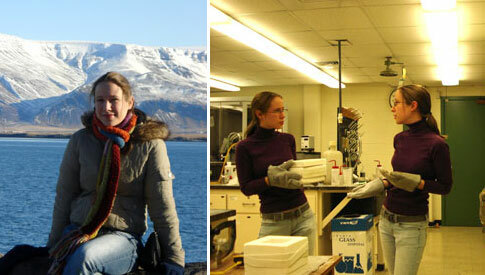 I joined the Smith lab in the summer of 2008. My primary research interests are in understanding the properties, reactivity and thermodynamics of materials. In addition to conducting original research, some of my favorite and most rewarding experiences in the lab have been learning and applying analytical techniques to my research. I have been able to learn some basic theory and use of a range of instruments which include: Nuclear Magnetic Resonance (NMR), X-ray diffraction, BET, Differential Scanning Calorimetry (DSC), Thermal Gravimetric Analysis (TGA), as well as varying solid state synthetic techniques. As is the case with most of science, I have had successes and failures in my projects. One project with which I have had success is the impregnation of a silica mesopore host with inorganic nanomaterials (think of filling the holes of a honey comb!). Up to this point I have been able to impregnate the mesopore host with both LiLaTiO3 and niobium oxide. Given the success of this project I am hoping to remove the mesopore nanotubes of my niobium oxide and LiLaTiO3. I consider myself to somewhat of a pastry and candy connoisseur. I am always looking for new recipes and treats to sample, rate and review for my up and coming blog. I am also a huge heavy metal fan girl. I love going to concerts or just sitting and listening to a new album. Worcester has a great metal community with one of the largest metal venues in the state right down the street from Clark; on top of that I’m incredibly excited to say that I’ll be attending the largest heavy metal festival in the world this summer!